India's second largest state-run bank has uncovered a $1.8bn (£1.3bn) scam linked to a single Mumbai branch. 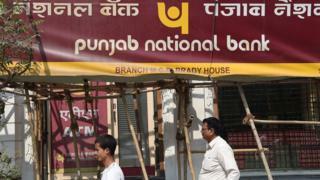 The fraud amounts to nearly a third of Punjab National Bank's (PNB) market value, and 50 times its profits for the last quarter of 2017. The bank said the fraudulent transactions appeared to benefit a handful of customers. But there are concerns the fraud could affect other banks, and hurt confidence in India's banking sector. India's Enforcement Directorate, a government agency that fights financial crime, will probe the possibility of money laundering in the case. In a regulatory filing, PNB said the transactions were "for the benefit of a select few account holders with their apparent connivance". It signalled that the fraud could affect other banks, which "appear to have advanced money to these customers abroad". Shares in the bank have fallen by more than 10%. Separately, PNB has made a fraud complaint against prominent Mumbai jeweller, Nirav Modi. India's Central Bureau of Investigation (CBI) is investigating the allegation that Mr Modi and five others defrauded PNB of $44m in collusion with a deputy branch manager. Mr Modi is yet to comment, but reports suggest about a dozen of his premises across India have been raided by police. The CBI has not yet said yet if the case is connected to the $1.8bn fraud. Indian state banks have been struggling in recent years, stung by a surge in unpaid loans. That bad debt has made it more difficult for banks to increase lending to businesses, that could accelerate the economic growth of Asia's third-largest economy. The government recently announced a $14bn bailout for state-run banks.